I had someone ask me today where they could find my instructions for making the hammock half bug net, or “HUG” as I called it back in 2010. I’ve republishing them here for reference with the caveat that I’ve improved on the design, which will be published in my upcoming book, The Ultimate Hang 2. Stay tuned! Let me be absolutely clear: the hammock half bug net is not for the faint of heart. It was designed for minimalist DIY-ers who want to maximize weight loss and minimize pack bulk. The HUG is a compromised bug shelter that is only effective when used with a pad or under quilt and a sleeping bag or top quilt. Full bug protection comes when the body is covered by the insulation in conjunction with the HUG. Additional weight savings can be made by trimming the sides to better follow the contour of the hammock. Sewing the netting to a hammock can further save weight and make it more secure. Paul over at Arrowhead Equipment used this design and sells a commercial version. Dutch has adapted the HUG and sewed it onto a hammock in 2015: the Halfwit Hammock. Derek, I’ve made a couple of your HUG bugnets and have really liked the easy entry and exit. However, I just made an 11′ Hexon 1.6 wide from Dutchware fabric and the HUG is too short on the head side of my hammock leaving a gap. 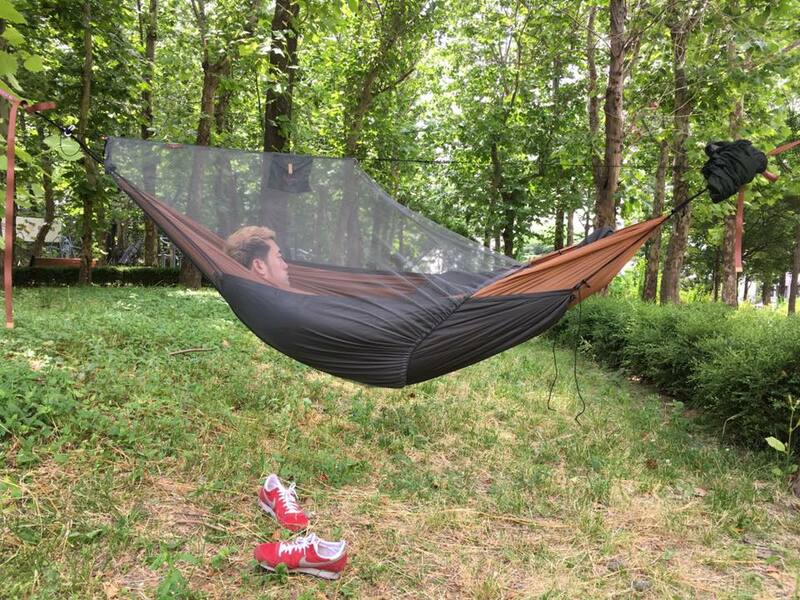 I’m thinking that it has to do with the increased structural ridgeline height above the hammock with the 11′ hammock. Any design change suggestions to make it work? I forgot to mention that I have my ridgeline running inside the HUG net so I can use it for my organizer, glasses, etc. Gotcha. Yeah, doing that can really lift the bug net out of spec for the design. You could lengthen the sides and reduce how you angle the fabric to the end of the hammock. I’d remembered seeing this Half-Net on your site and came back to find it again. Me thinks it might work will in Minnesota where we have bugs AND cold weather at the same time, when used with a Cocoon style surround quilt? A cocoon-style should work fine. It will constrict a lot, which may affect the way the netting drapes. I’ve not tested that scenario, but give it a try and let me know!